The Lifewise Way is about who we are as an organisation and how we are as people. independence, tolerance and breaking new ground into the future. The Lifewise Way is a guide to how we work together to create a better world. 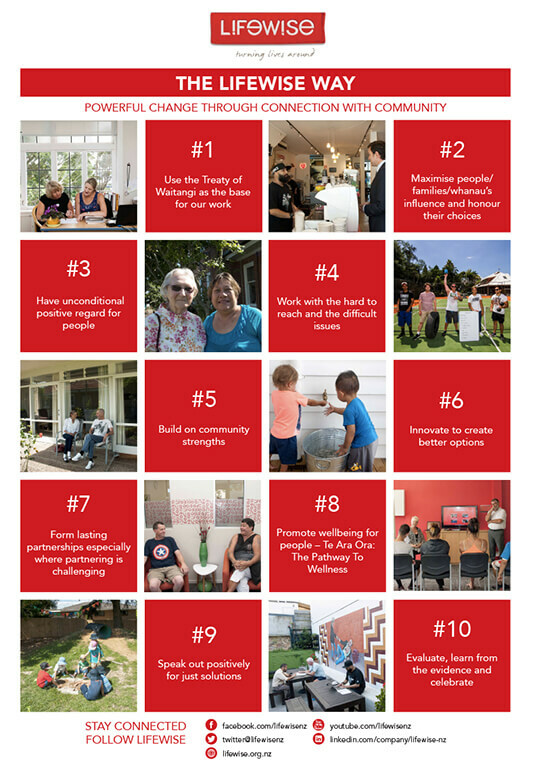 Lifewise are an Auckland-based community social development organisation, who develop new ways to solve challenging social issues and work with families, older people, people with disabilities, and people at risk of homelessness to turn people’s lives around. Lifewise’s roots trace back to over 150 years ago within the Methodist Church of New Zealand, and the organisation has since changed and developed to meet the needs of Aucklanders as the city grows. Focusing on the principle of interdependence rather than independence or dependence, Lifewise are recognised for their work providing sustainable solutions to social issues, rather than focusing on simply meeting immediate needs, in an attempt to address the root causes of social isolation and disadvantage. Lifewise offer services and support for individuals and families to imagine a better future and build their capacity to achieve that vision. In order to make a tangible, long-term difference to issues surrounding homelessness, Lifewise works to an internationally acknowledged Housing First model, and is working to influence homelessness intervention practice at a national level. We also run Lifewise Merge Café, located on Karangahape Road, providing affordable, nutritious food for everyone. Merge Café encourages people from all walks of life to share food and conversation, and all proceeds raised go towards supporting people who need housing support. The café offers people a safe environment that embraces choice, dignity and respect, and also enables people in need to access Lifewise’s staff and services.